Connecting a home’s interior to its exterior and outdoor surroundings is becoming more and more important to homeowners. 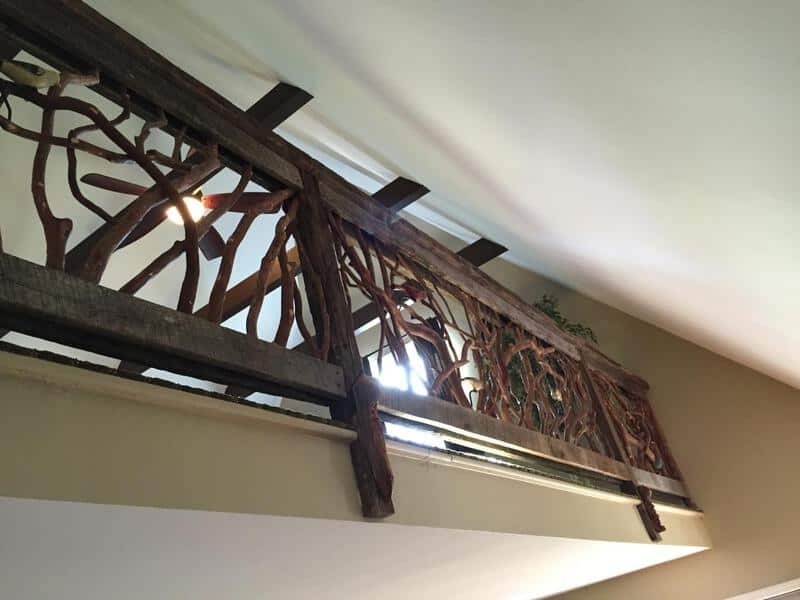 As you’ll see in the pictures, a homeowner selected branch infill for interior and exterior railings to create a cohesive flow throughout his Craftsman home and tree-lined lot. And the result is stunning! 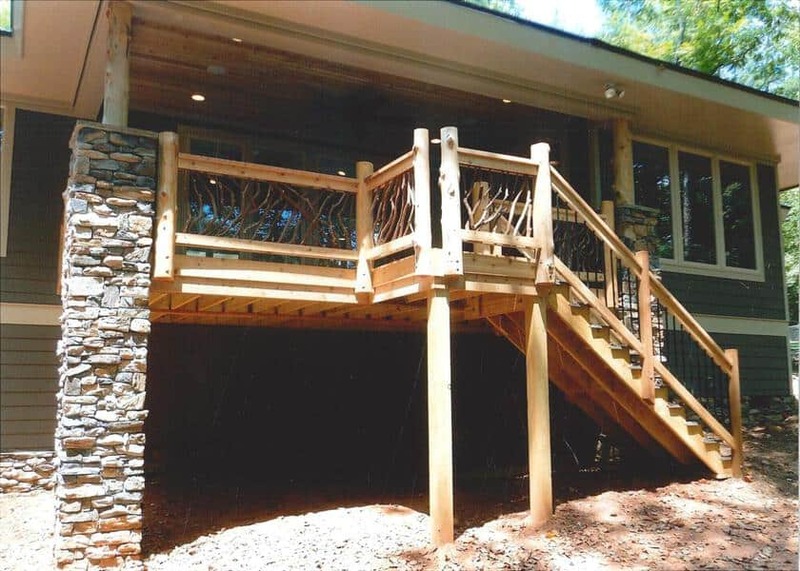 The railing with balusters made from mountain laurel branches softens the height transition from the woodsy yard to the main floor. In order to clear the lot for the home’s foundation, a few red cedars were cut down. 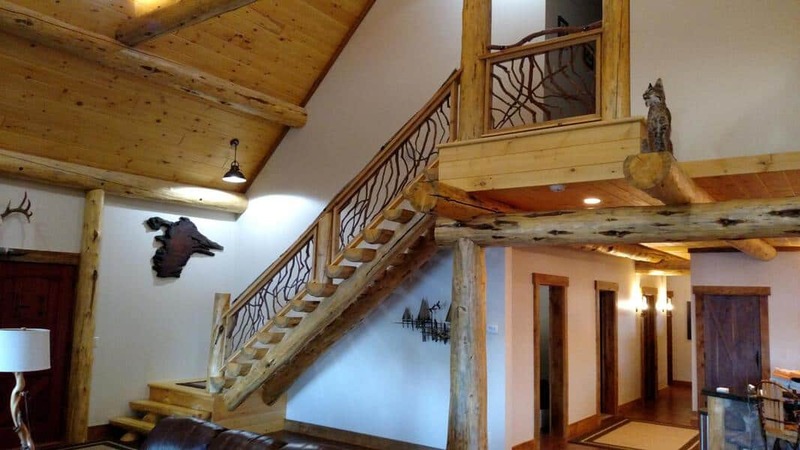 In keeping with a unified look, the homeowner used them to make the handsome log newel posts. 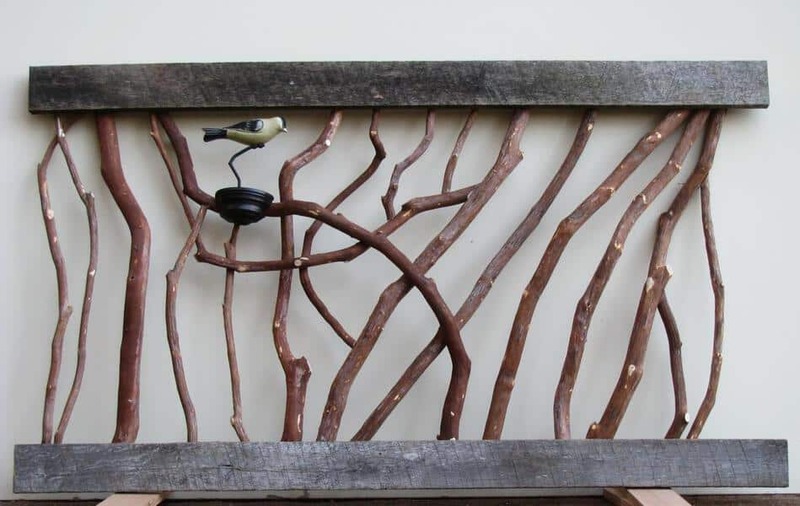 Mixed media is another popular trend. 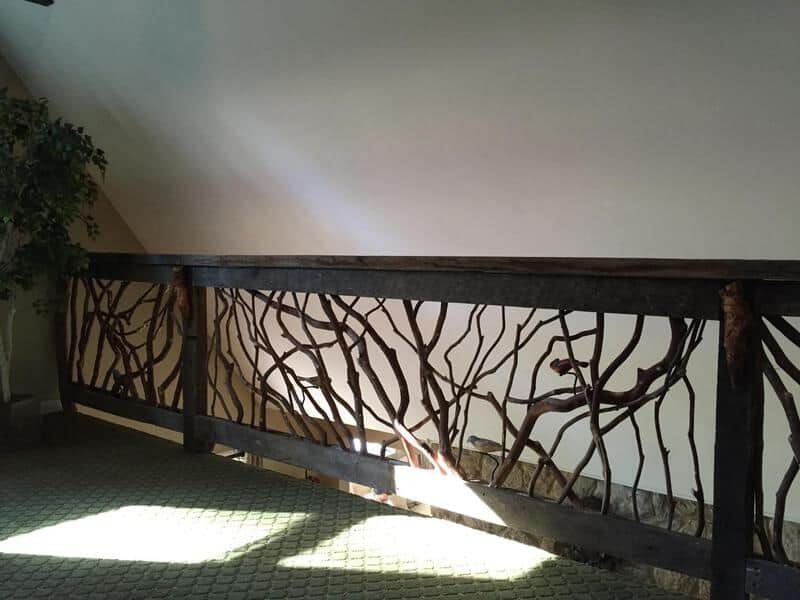 The stairway railing features round metal rods that maintain the rustic look while mixing nicely with bark covered branches. This spacious covered porch is perfect for entertaining or just relaxing in the shade and enjoying nature’s scenery. To get more use from the outdoor deck the homeowner installed recessed lighting and also a ceiling fan for warm weather comfort. From a design perspective, twisting and turning twigs add movement and flow to the wood plank floor and paneled ceiling. Notice how the sinuous outline of the branches really stands out behind the sunshine and complements the trees. 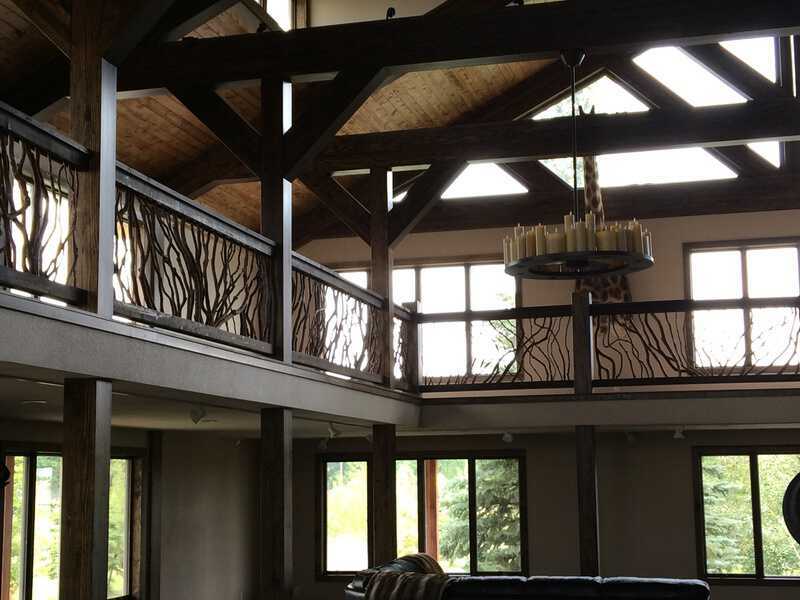 The homeowner chooses to complement cedar deck railing for interior and exterior décor. 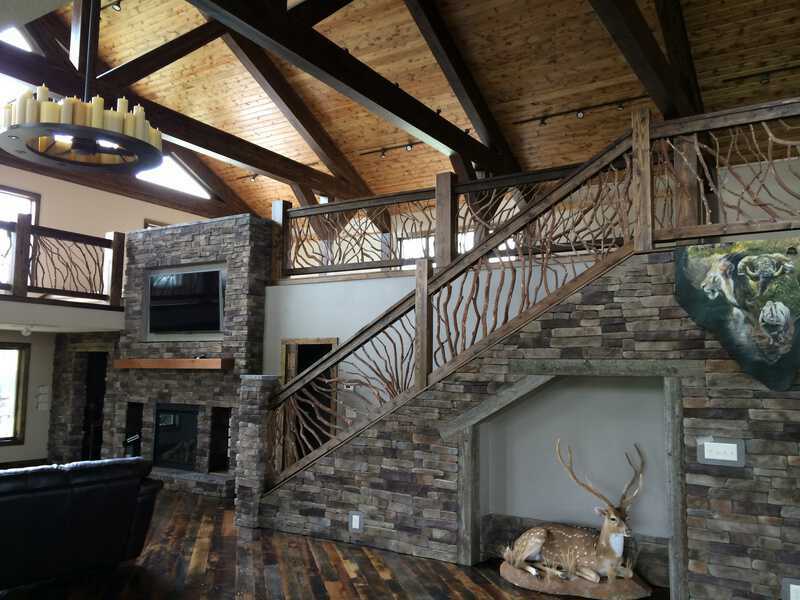 Instead of using rough cedar logs for newel posts, square posts were installed and stained for a contemporary look in the interior. 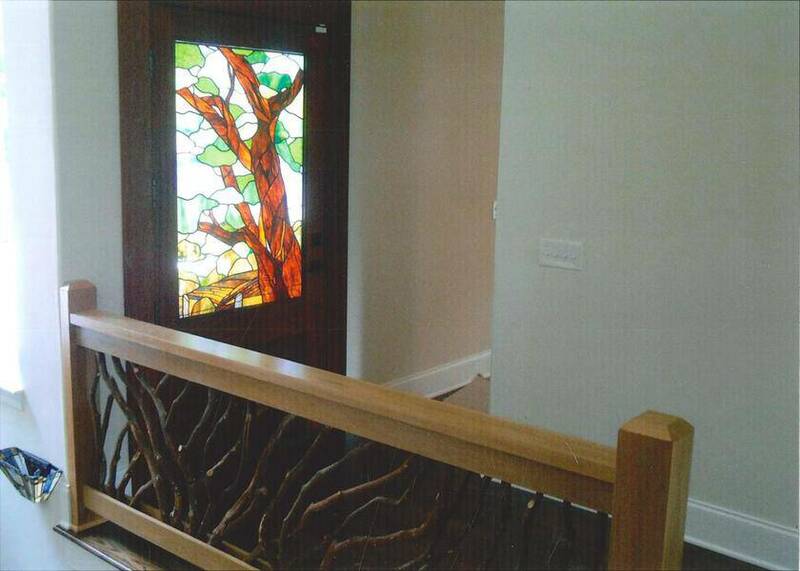 A stained glass window features an Osage orange tree that blends beautifully with the twig and branch infill in the interior railing. 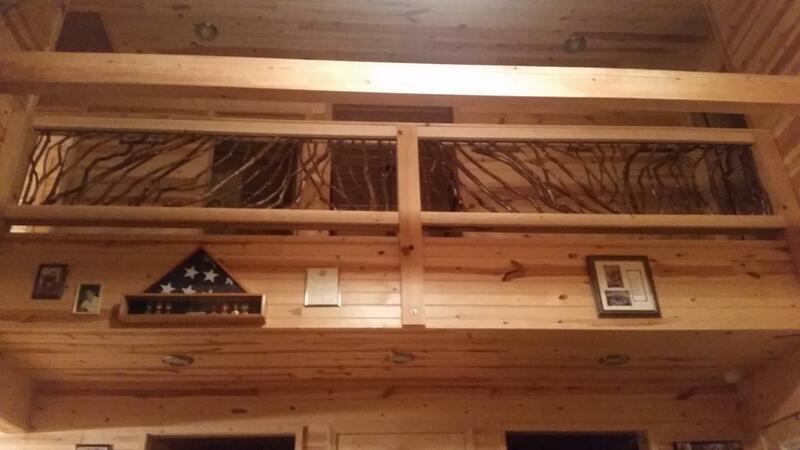 Notice how the branches are arranged to spread out like those in the stained glass. 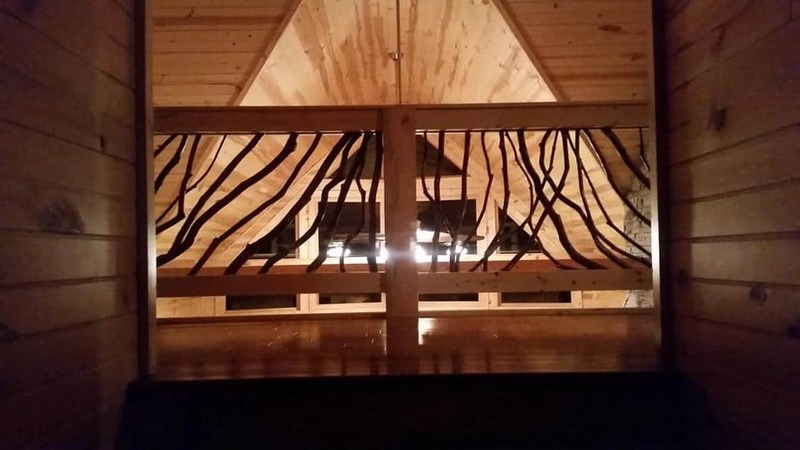 Just like the stained glass work, the interior cedar deck railing is a piece of art. 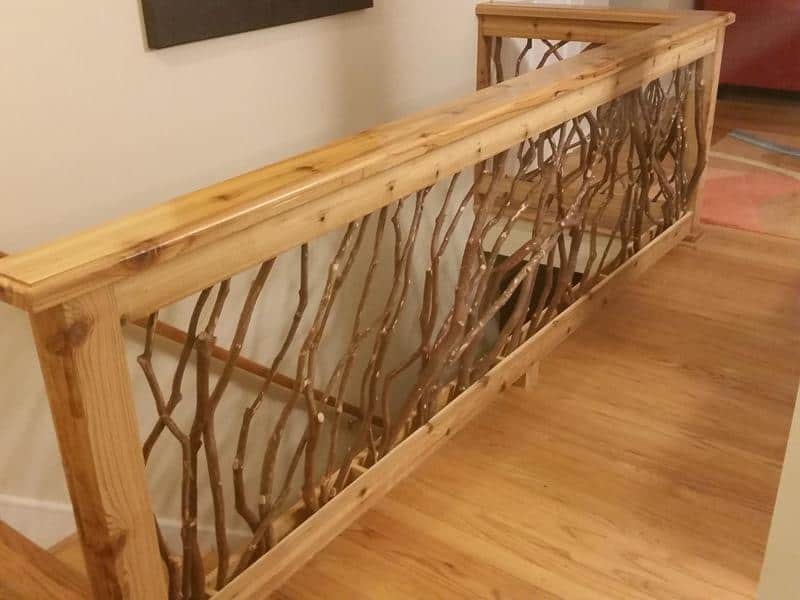 Each branch is unique as well as the overall pattern within each railing section. Overall, this entrance way feels like an extension of the tree-lined landscape outdoors. Our new home is finally complete and all of the packing boxes are empty. 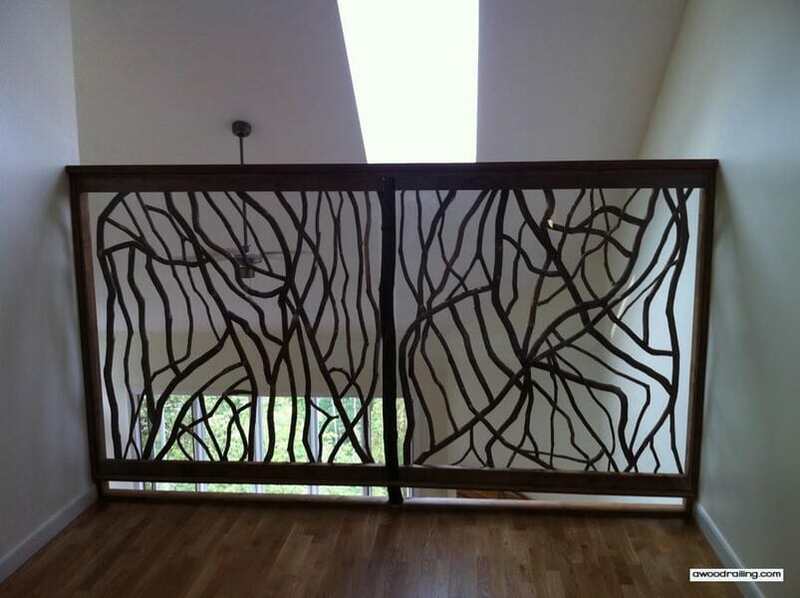 Enclosed are photos of the railings you made for us. While, for me, the handrails were one of the most difficult design elements of our home, we are very, very pleased with the result. When all is said and done, the handrails are exactly what we envisioned. The stained glass front door panels is modeled after a big Osage Orange tree (used for hedge rows in Kansas to prevent erosion), which was in our back yard in Kansas. It always fascinated me. In the foreground (somewhat difficult to see) are plowed fields and a barb wire fence. On the exterior can be seen 5 or 6 tiny “m” shapes representing the Canada geese, in flight, in the distance. 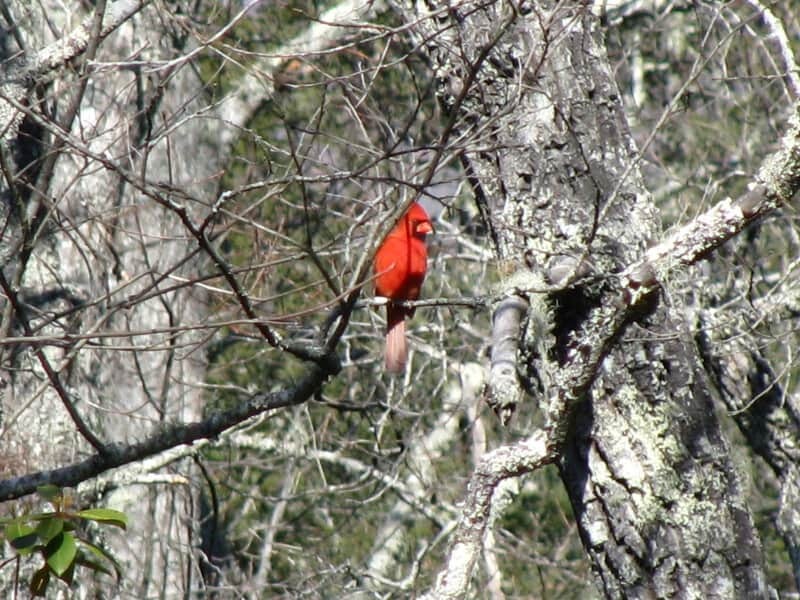 They make Kansas their home throughout the year. Throughout our travels, we have tried to obtain something significant to represent each place we lived. This panel pays homage to Kansas. Sadly, we had to sacrifice a number of red cedars to make room for the house’s foundation. However, as you can see, many of the red cedar logs became the newel posts on the deck. 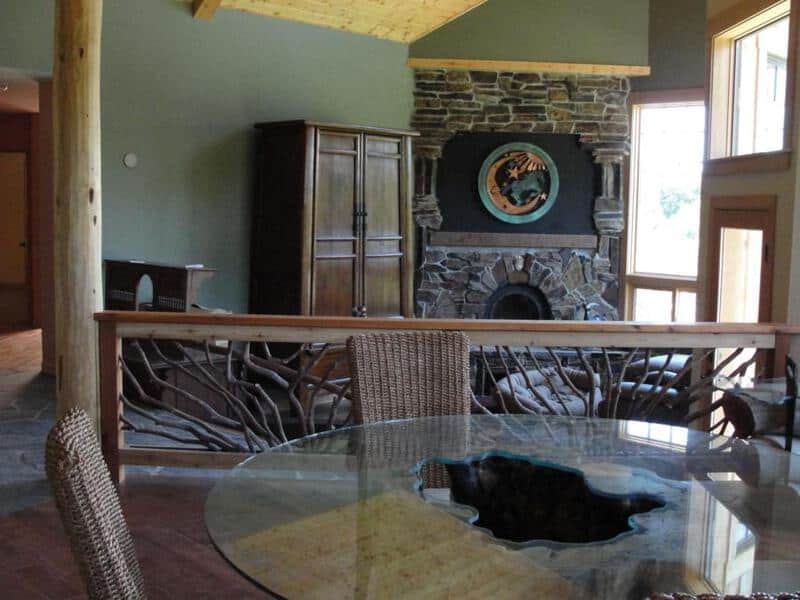 The fireplace mantle is cut from the largest log. There are two pillars in the great room, also of red cedar. The bark was removed by pressure washing. 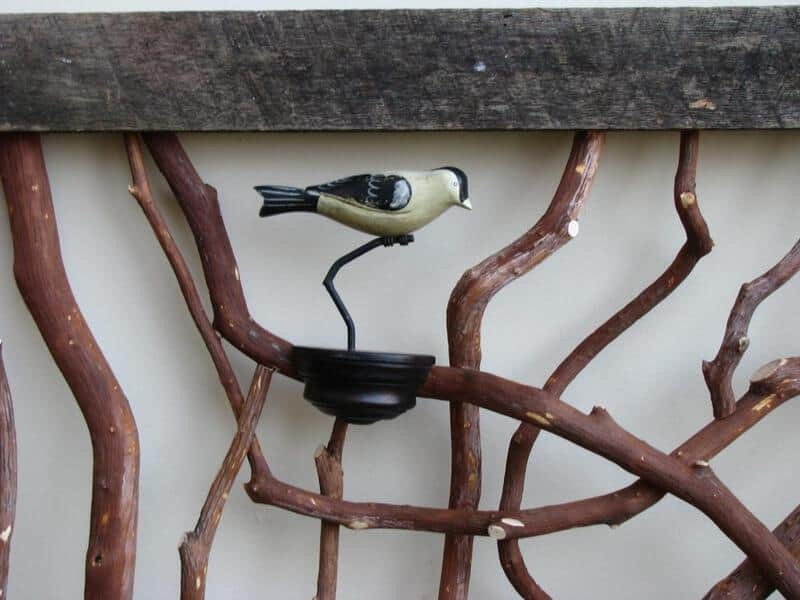 Thank you very much for all your patience as I tried to understand the process of fabricating twig railings. 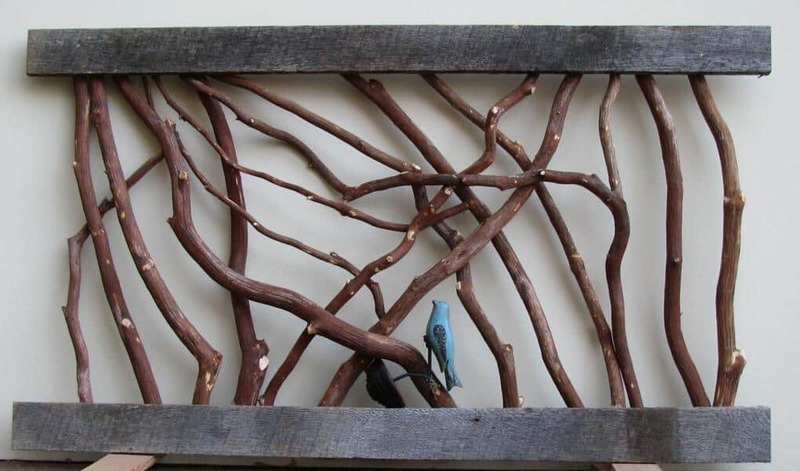 Natural twig and branch infill work beautifully for interior and exterior design while creating a connection with outdoor surroundings. 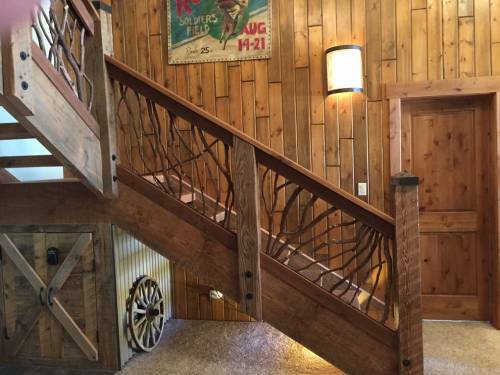 If a cohesive design flow is important to you, contact us at Mountain Laurel Handrails to learn more. 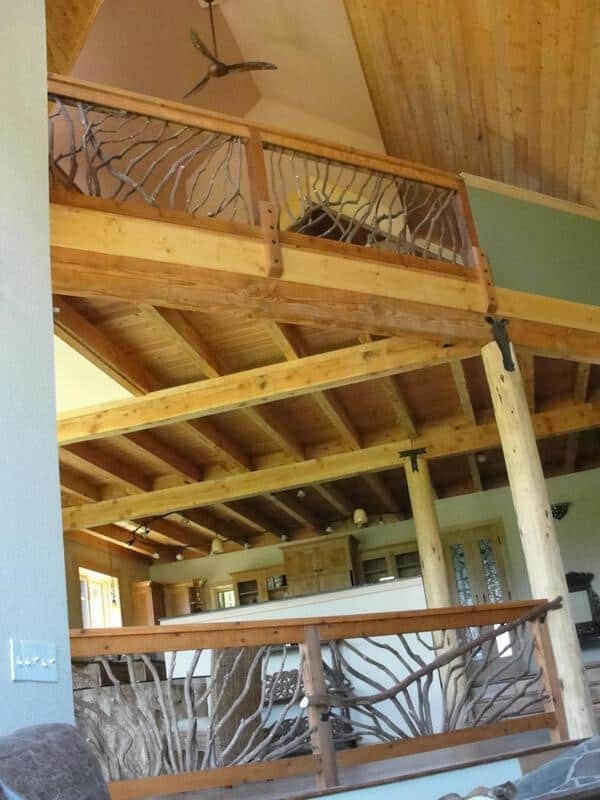 Big Sky Montana railing gets its inspiration from the rugged terrain and other natural surroundings of this home’s amazing locality. Montana, nicknamed Big Sky Country is famous for its magnificent mountains, alpine forests and abundant wildlife. 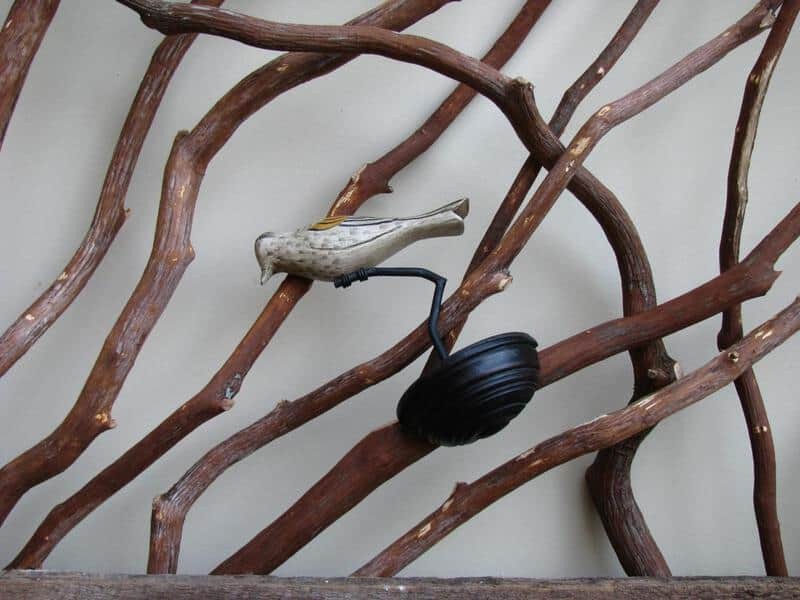 So instinctively, the homeowners wanted to incorporate local elements into their interior design. 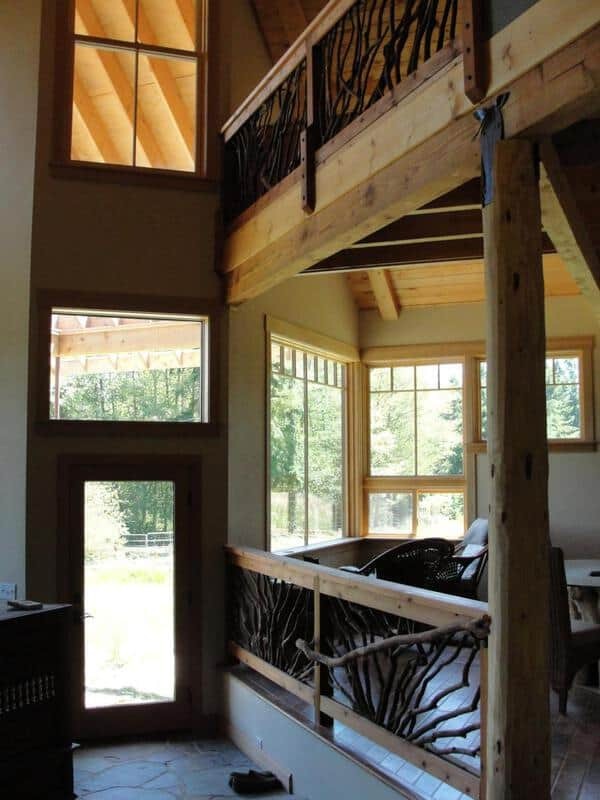 Natural and rustic, the Big Sky Montana railing artfully outlines this staircase from the balcony to the landing. Rough hewn posts recreate the look of early mountain-style architecture. 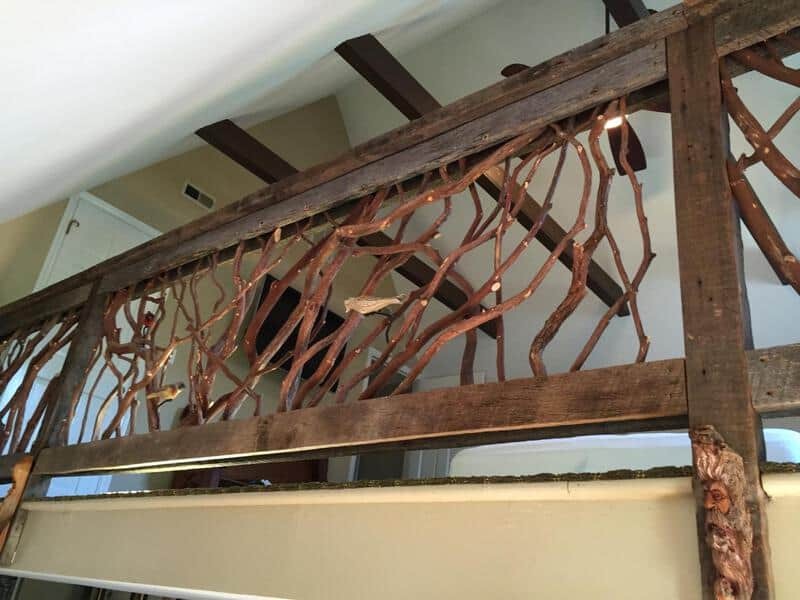 In similar style, organic Mountain Laurel twigs twist and turn forming a unique pattern within each railing section. 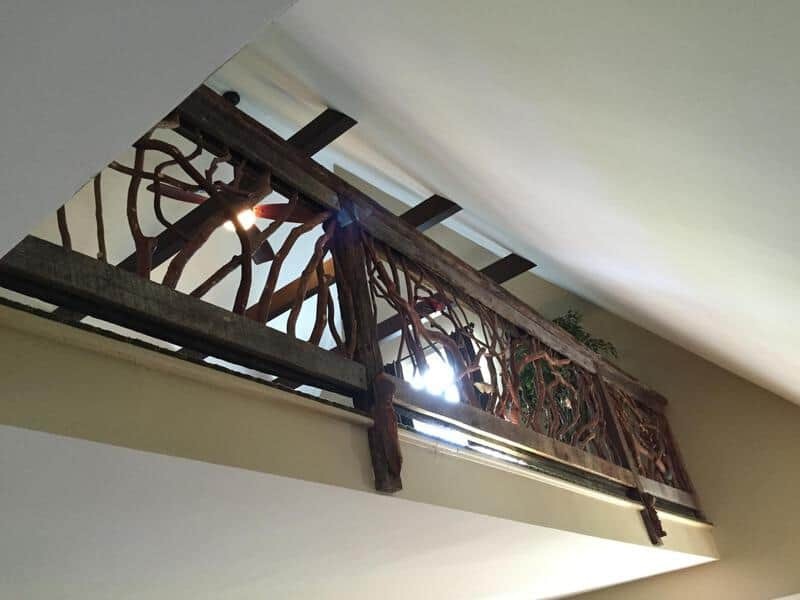 The large, black bolts used to mount the railings to the staircase add another vintage touch. Rugged metal caps top the posts. 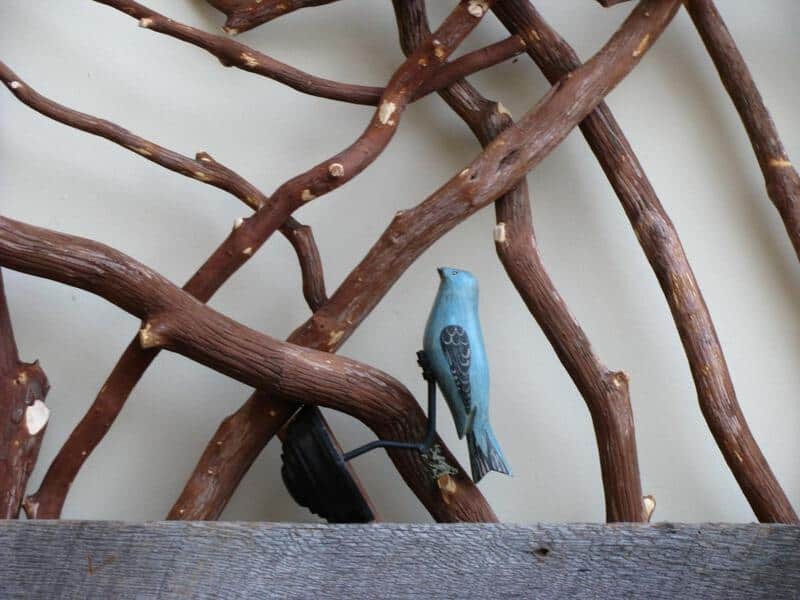 It’s amazing how these small accents make a big impact on the railing’s bucolic appearance. Thanks for everything, they look great. 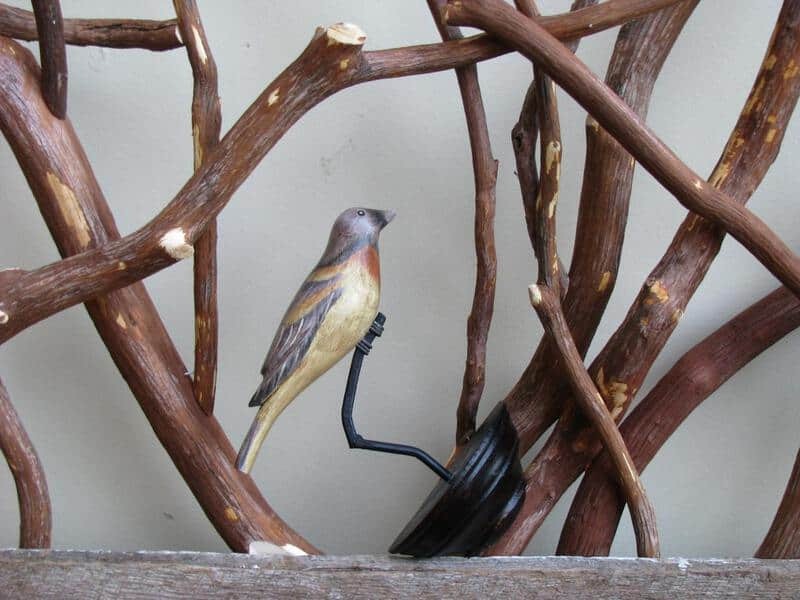 I’m quite sure you’ll be seeing a few more orders from Big Sky, everyone is oohing and aahing over these. Big game hunting is part of Montana’s culture and history. 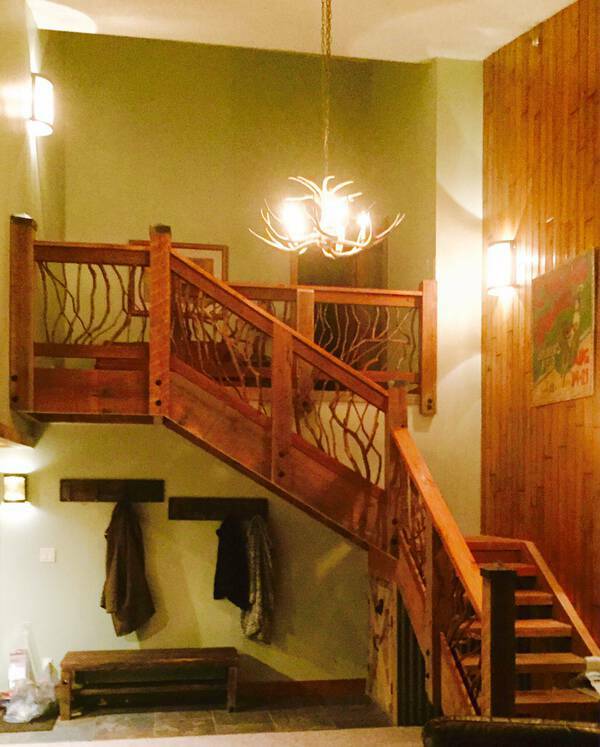 In keeping with tradition, a Rocky Mountain elk chandelier shines above the staircase. 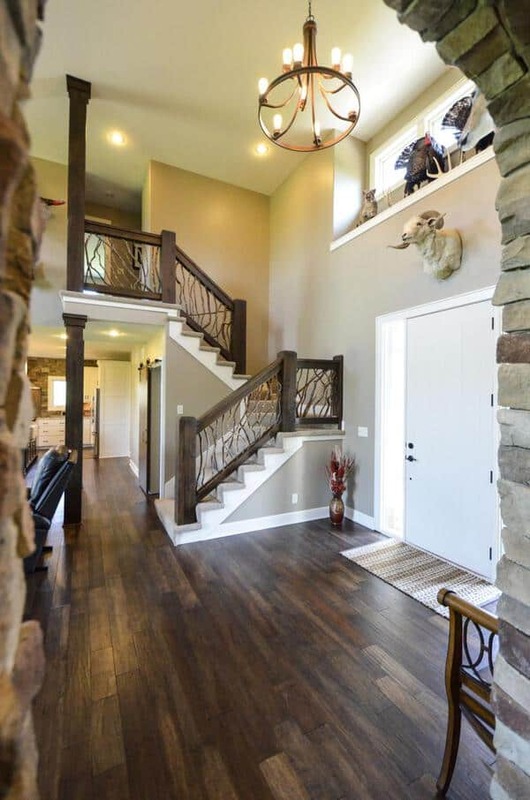 Notice how this rustic light fixture complements the Big Sky Montana railing perfectly. We also like the towering, wood paneled wall on the right that completes the look. The panels and railings boast a matching walnut stain, which pops out against celadon walls in the backdrop. 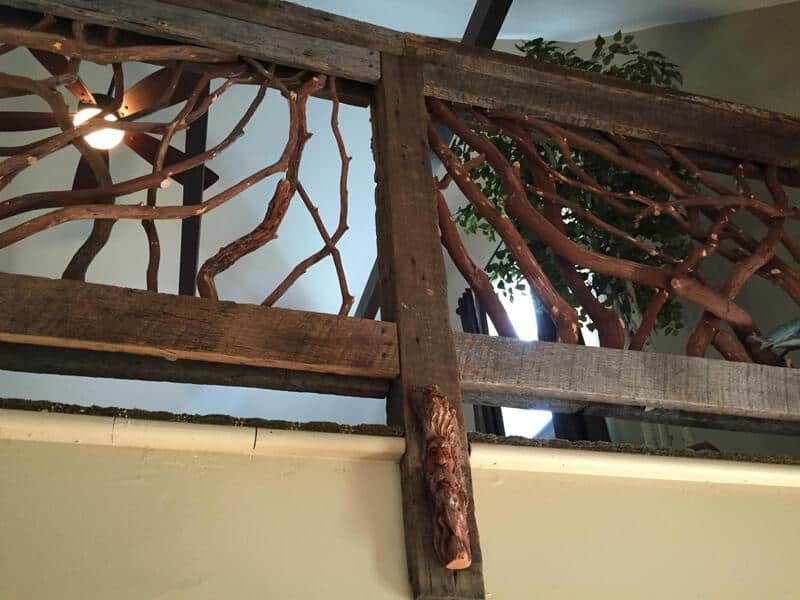 The picture above is a close-up view of Mountain Laurel branch balusters, showing their interesting details–bark and all. 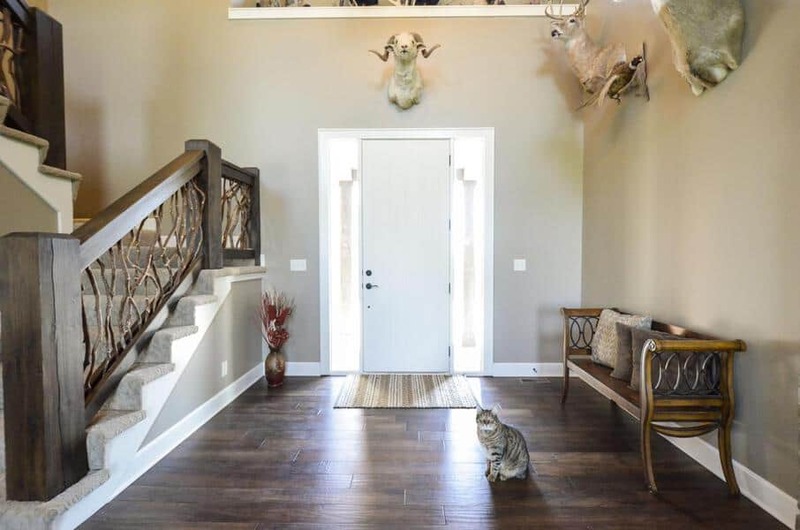 This foyer offers an eye-catching mix of architectural styles, local elements and traditions. Overall, the form displays a dash of contemporary design, while the Big Sky Montana railing features classic mountain-style architecture. 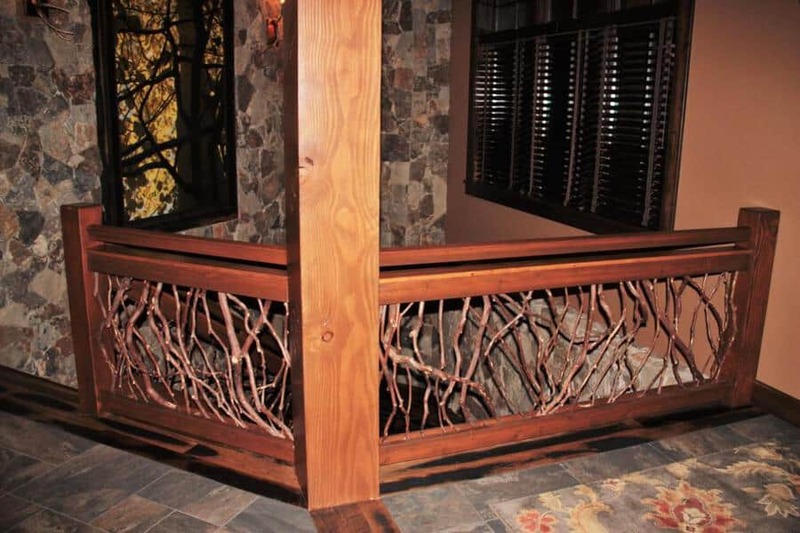 Enhance the natural beauty of your mountain retreat with the one-of-a-kind look of Mountain Laurel Handrails. 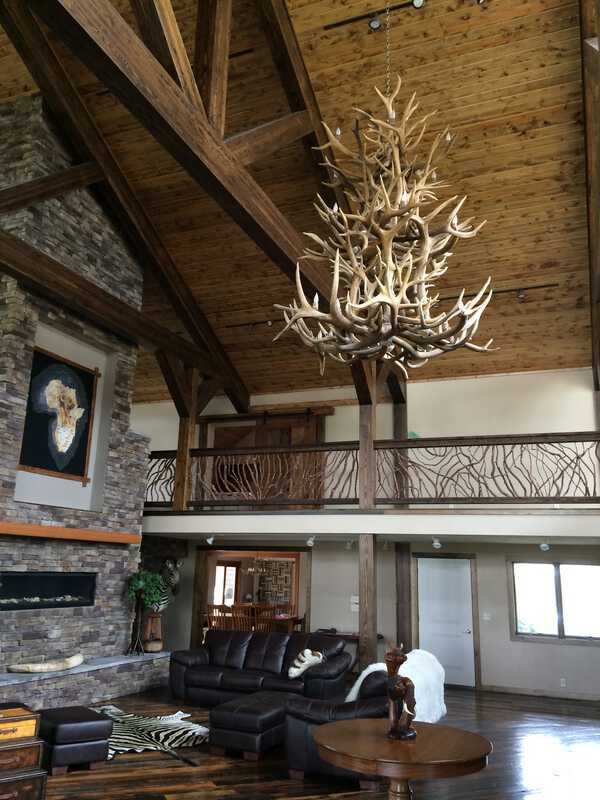 The homeowner on this project wanted something that would match her husband’s mounted trophies but would also be artistic and creative. 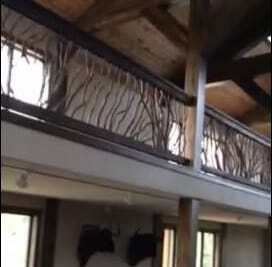 She found the perfect balcony handrail for her North Dakota lodge in Mountain Laurel Handrails. 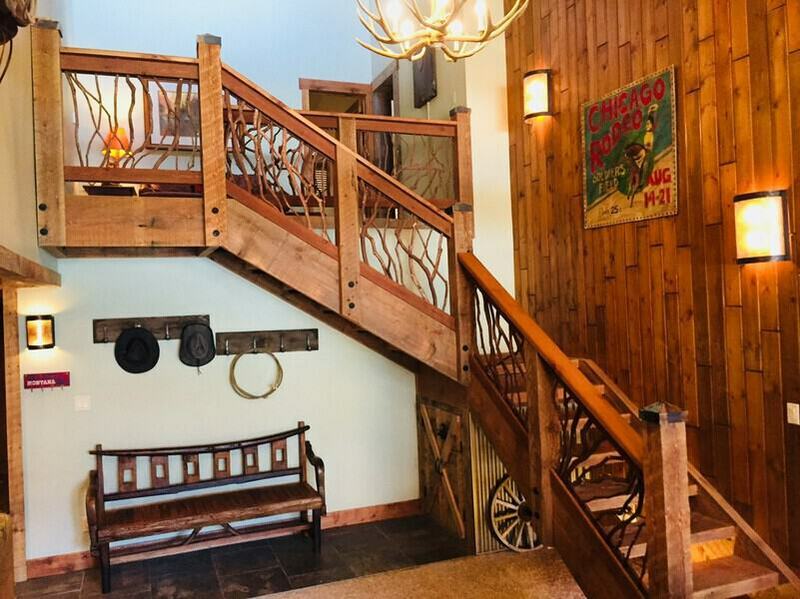 Custom build branch railings are the crowning touch for the timber-framed lodge with its full balcony and central staircase. Natural materials mingle with apricot hues to create a warm and welcoming glow in this stair railing in stone staircase. Not to mention, the look is lovely! 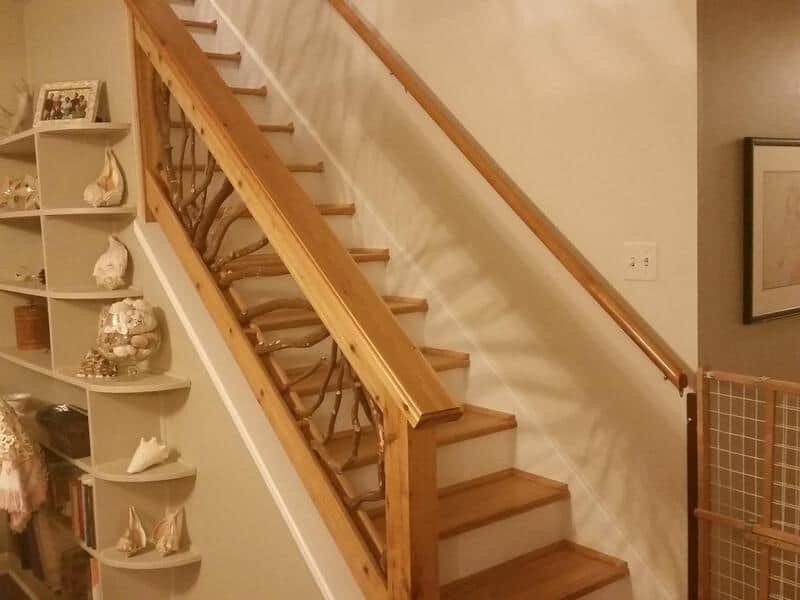 Let’s take a peek at all the fine details of this sprawling staircase from top to bottom. As you can see in the picture above, a stairway is more than a means to get from one level of your house to another. It is a major architectural design feature. And the right railing in the right surroundings can turn a staircase into something special. 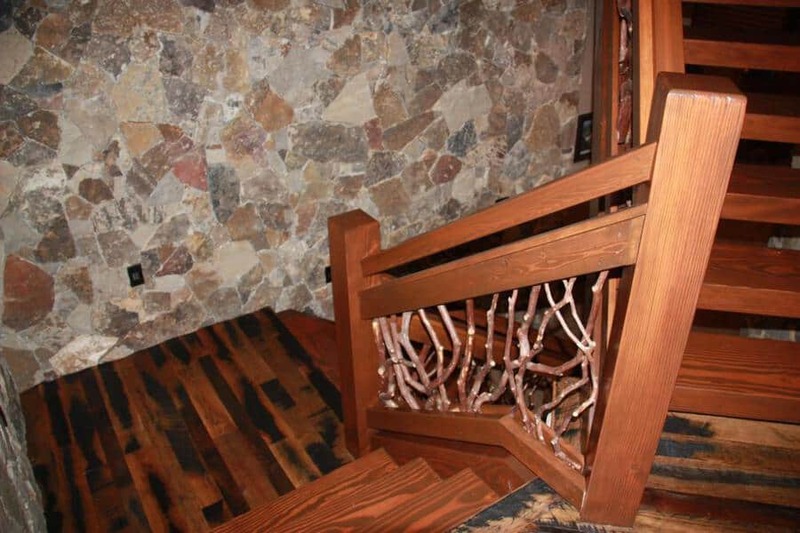 The wood stair railing is constructed from natural wood materials to complement the fieldstone walls. 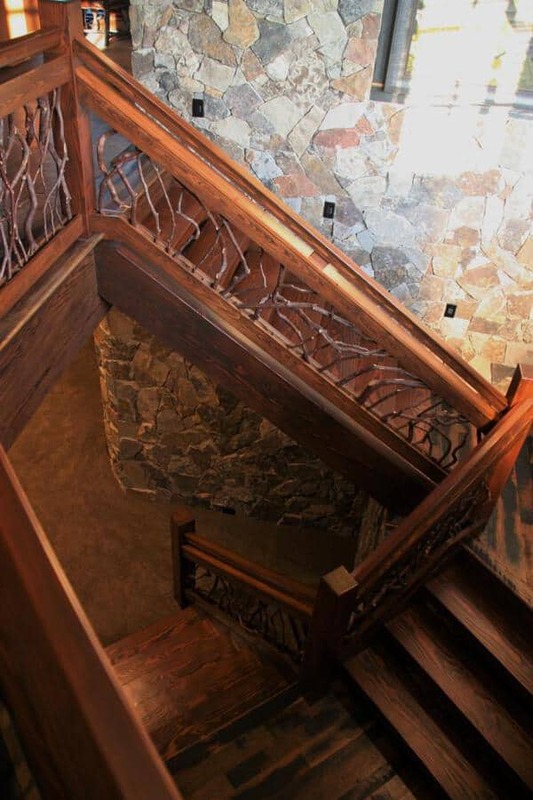 Amazingly, the look of this stair railing in stone staircase is a mix of elegance and rustic. 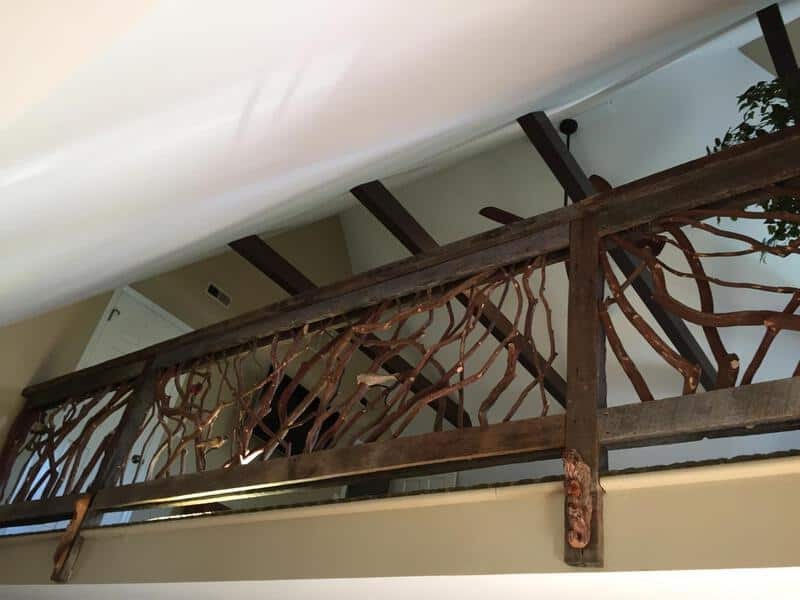 The custom handrail features a top rail, while two additional rails frame the balusters like a piece of art. Flowing Mountain Laurel branches create the fluid infill. This is another unique feature as no two branches and therefore, no two sections are alike. 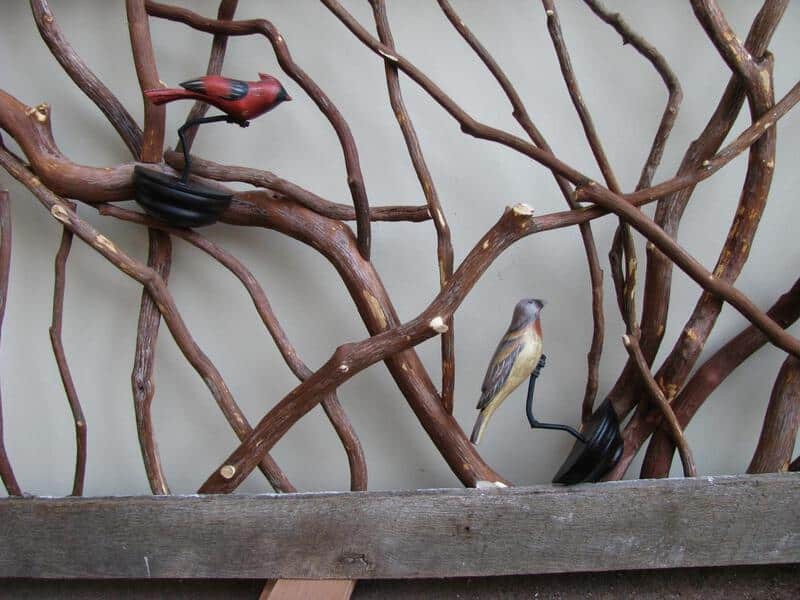 Rough bark covers the balusters and creates an interesting contrast to the smooth and polished rails. Variegated wood landings connect the platform stairway as it changes direction on its long way down to the lower level. Thick stair treads are made to match other elements in the stairway, beautifully. Additionally, the open riser stairs add an element of airiness to the staircase. The walls along the staircase are faced with irregular fieldstone creating a mosaic pattern. Multi-colored stones in neutral overtones contrast nicely with the chestnut stained rails. 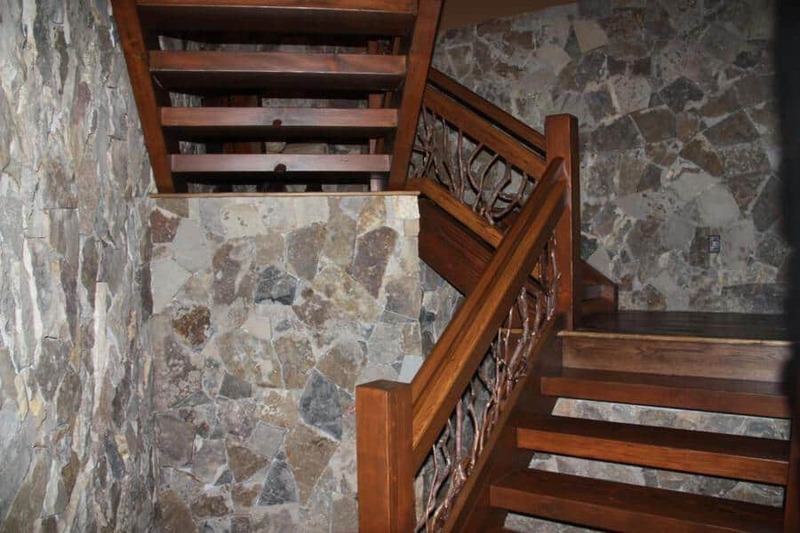 The stair railing in stone staircase is indeed the showpiece of this home. It flaunts an old world charm featuring natural elements. 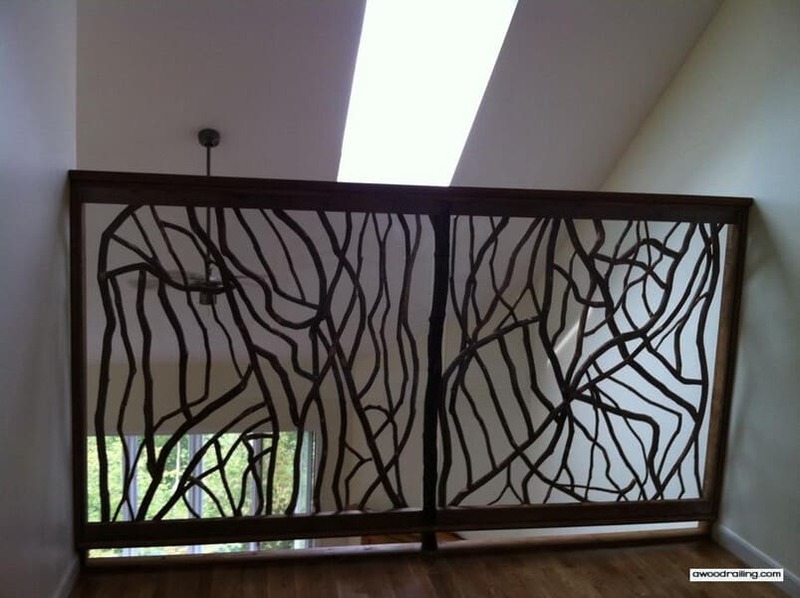 If you’re considering custom railings of exceptional beauty, send us your project details or questions to get started. 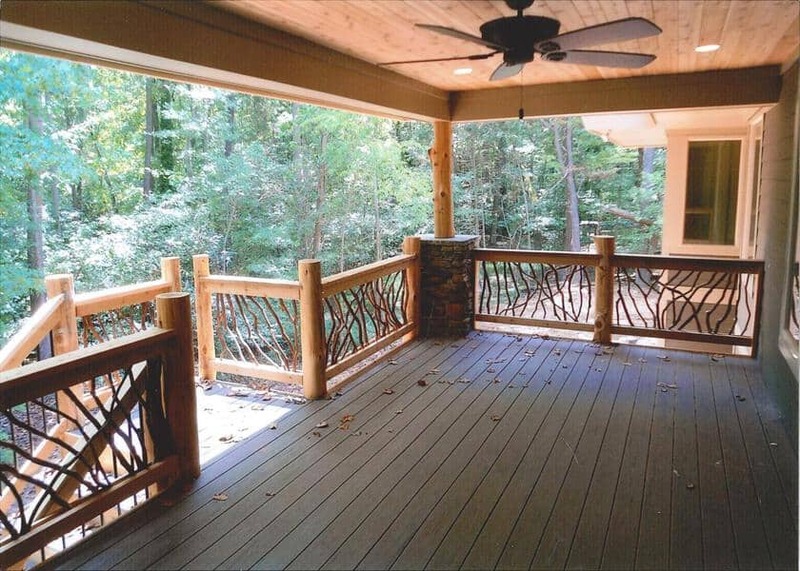 This lake time balcony railing mirrors the homeowners’ message of ease and enjoyment! The owners of this cozy lakefront home wanted to define their interior with an openness that blends with the lake and outdoor scenery. 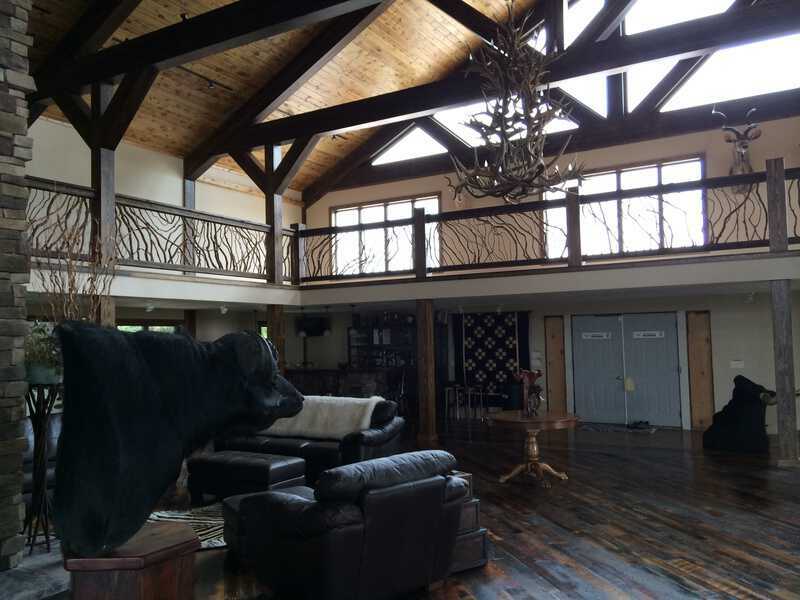 They did this perfectly with a large balcony overlooking the great room, complemented with a staircase that’s open on one side. 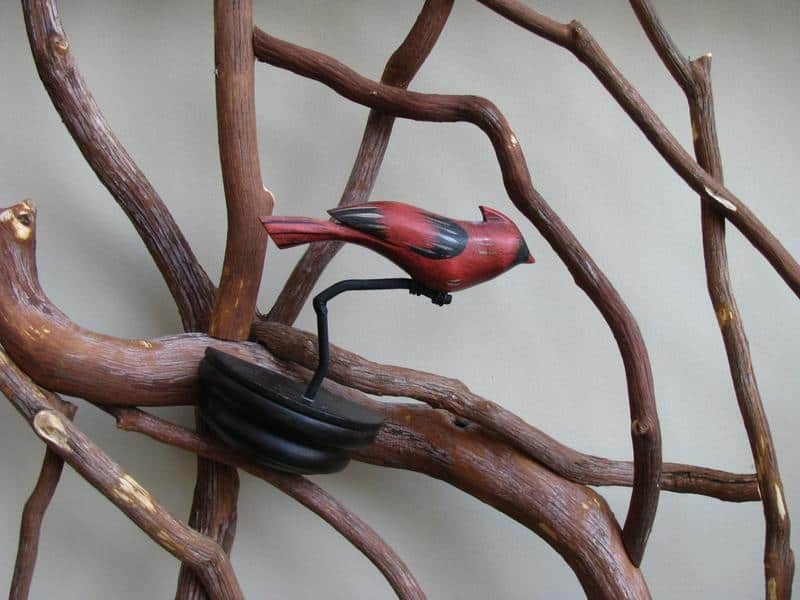 To harmonize these architectural elements they tapped into the talents of craftsmen at Mountain Laurel Handrail. 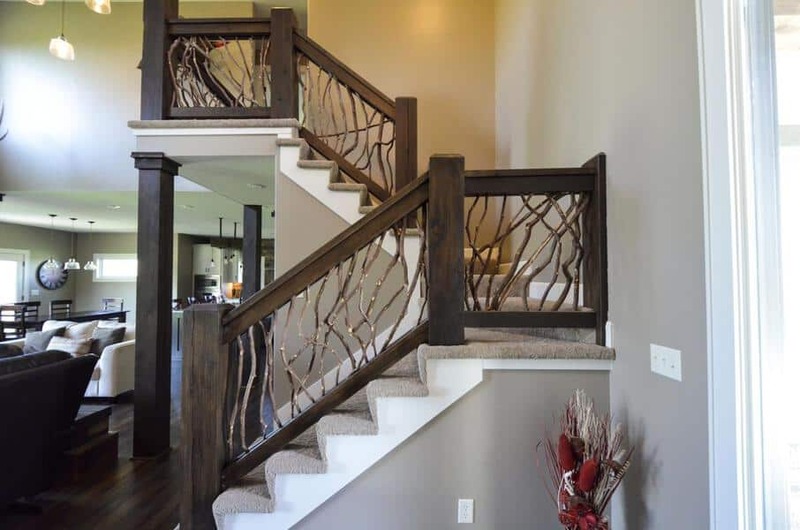 The rails and balusters feature natural overtones to enhance the home’s easy and relaxing feeling. All in all, this indoor space expresses the homeowners’ message perfectly. On Lake Time! 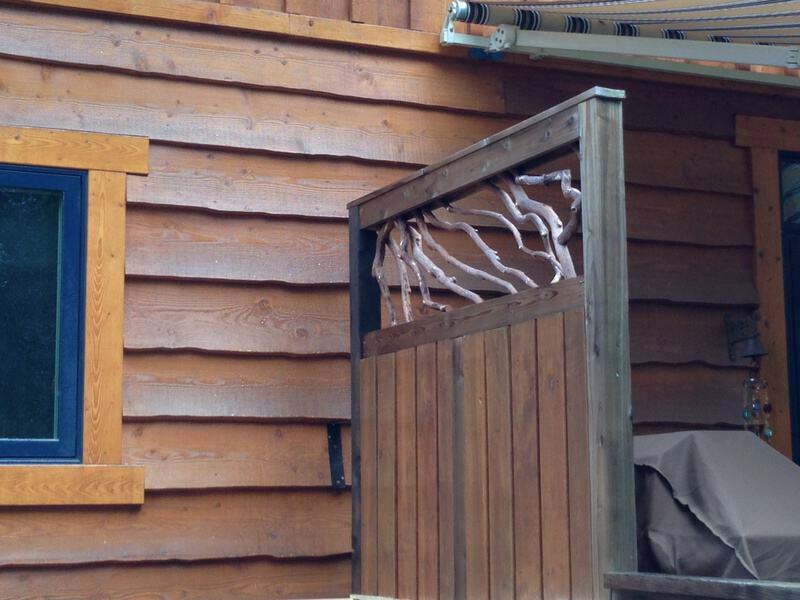 Blocky newel posts secure the post-to-post railing system. 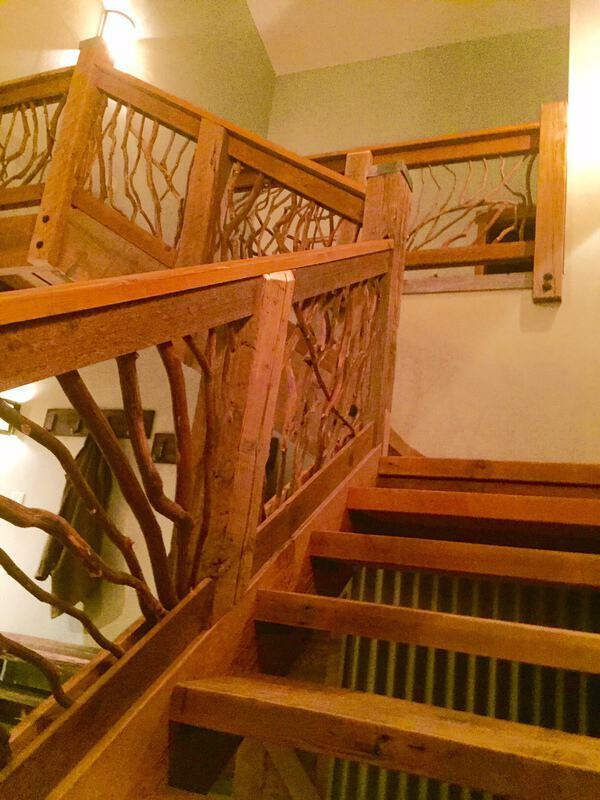 The linear handrails frame sinuous balusters crafted from branches covered in bark. It’s like bringing a splash of the outdoors in. 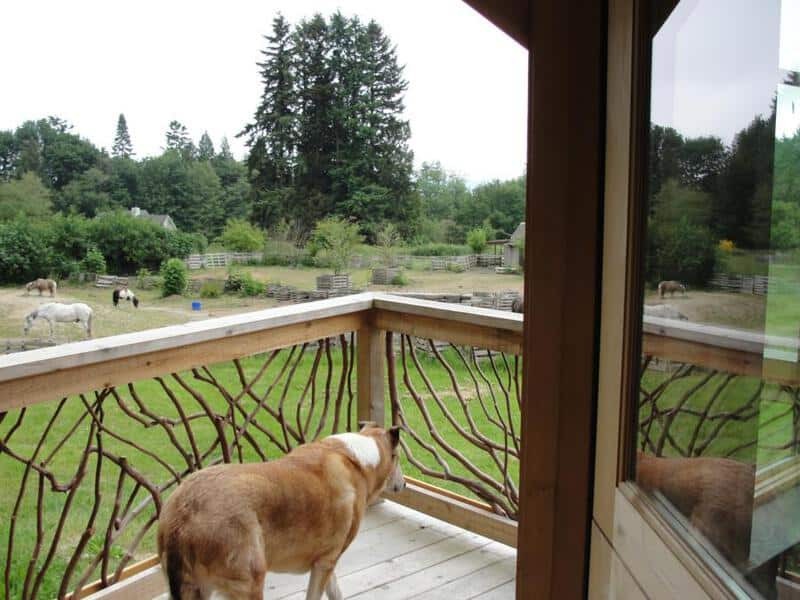 As you can see in the picture, the railings are both functional and decorative. 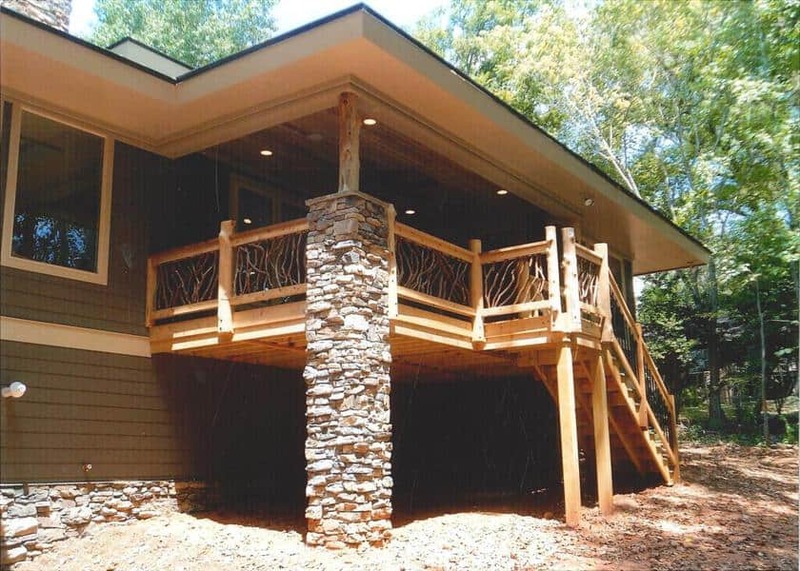 What’s more, the ideal railings for a lakefront retreat should be easy to maintain and weather resistant. Mountain Laurel branches need little maintenance and withstand the moist environment of coastal or lakefront homes. That means more fun and less work for you. Lake houses are all about easiness and enjoyment. In keeping with that principle, the homeowners’ decorated the interior with simplicity in mind. A few plaques with playful inscriptions and a couch with comfy pillows and cushions highlight the wall under the lake time balcony railing. Here, the homeowners selected a soothing color theme. Cool blue hues are on spot with the coastal look. Additionally, light beige walls add to room’s breeziness. The railings stained in walnut add a touch of contrasting warmth. 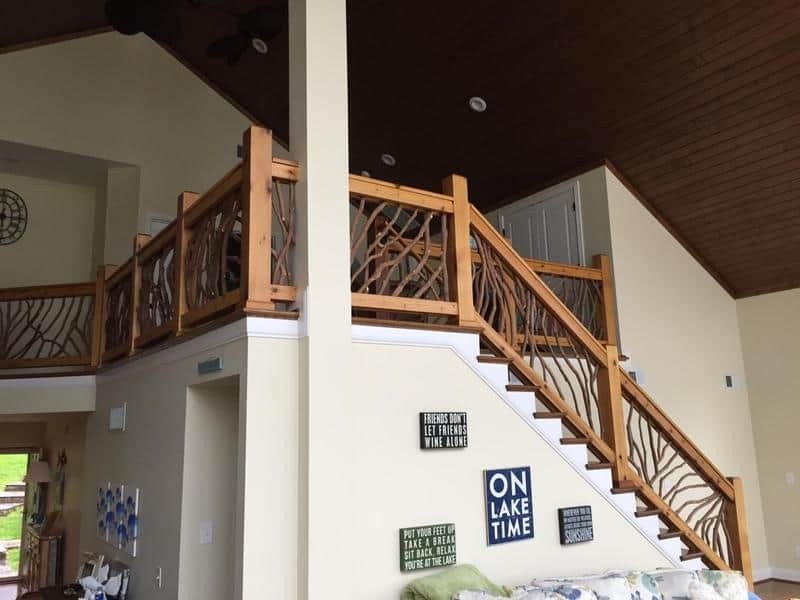 Clearly, this indoor space along with its lake time balcony railing, opens up to a sunny day on the beach! 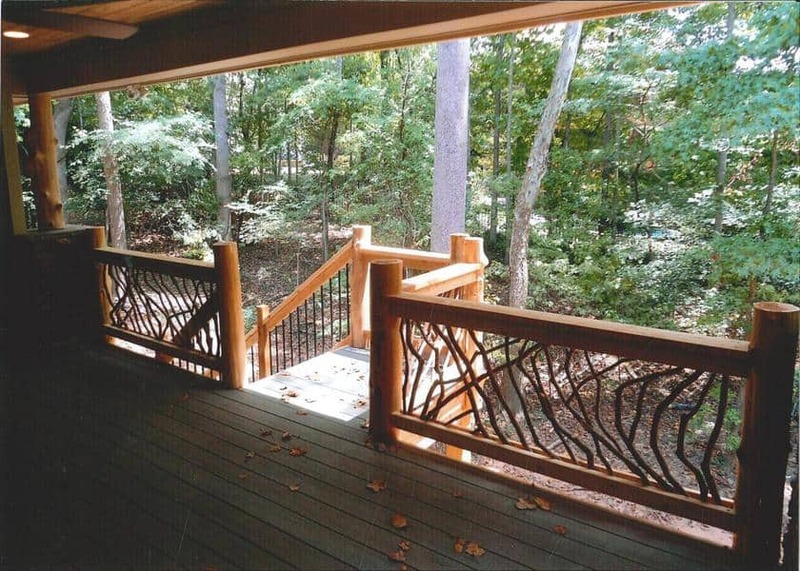 To make the interior of your lakeside retreat as eye-catching as the view, consider Mountain Laurel railings.